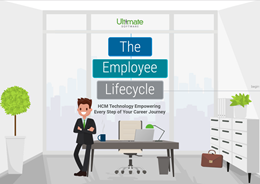 Discover how a best-in-class human capital management (HCM) solution can help your organization from recruiting to retirement. Your employees go through a lot of changes over the course of their career, from onboarding to promotions and everything in between. You need a comprehensive HCM solution to accompany them every step of the way. With a single solution, your employee can fill out first-day paperwork prior to when they start, easily choose and change benefit plans, manage their own direct reports, and plan for the future. Ultimate Software's UltiPro® makes it easy for all of your employees to track all of their competencies and goals, major life changes, and career development opportunities in one easy-to-use spot. You want to be there for your employees, and best way to do so is to empower them by providing a comprehensive solution that will be there for them at every milestone. Please fill out the brief form start the journey.